If you’ve ever had a tech support technician ask the type of motherboard or graphics card you’re using, wondered whether you have free slots to add more RAM (memory) to your computer and the type of RAM you have, or worried that your computer is getting too hot when it’s in use, then Speccy is for you. This little free application scans your Windows computer and provides a comprehensive list of all its hardware and associated software, complete with specifications for all components and statistics on their operation. This includes your CPU, motherboard, RAM, graphics cards, hard disks, optical drives, audio cards, peripherals, and network connections. It may sound like a geek tool, but Speccy is a time saver for anyone looking to troubleshoot, upgrade, or replace a PC or one of its components. For example, if you think you need more RAM you can use Speccy to determine how much of your existing capacity is currently being used by the system, the type of RAM you have, the number of RAM slots you have, and the number currently being used. You can take this information to a site such as Crucial to enter your specifications and purchase new RAM for far less that you would pay if you went back to your computer manufacturer or retailer and ordered an upgrade. 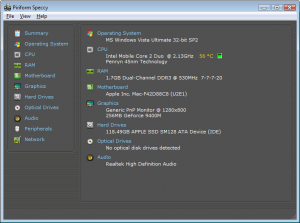 Speccy also provides the temperature at which individual components are operating. So for example, if you think your fan is running too loud or too often, or your computer feels hot to the touch, Speccy can show you which component is overheating (it displays temperature in green, yellow, orange, and red to indicate the danger level), and provides a graph of heat variation over time. Additionally, Speccy provides detailed information about your Windows Operating system, your system folders, your startup processes and locations, and all of the Windows hotfixes automatically applied to your computer. If you have an issue, this can be a valuable tool for tracking down the source of the problem. 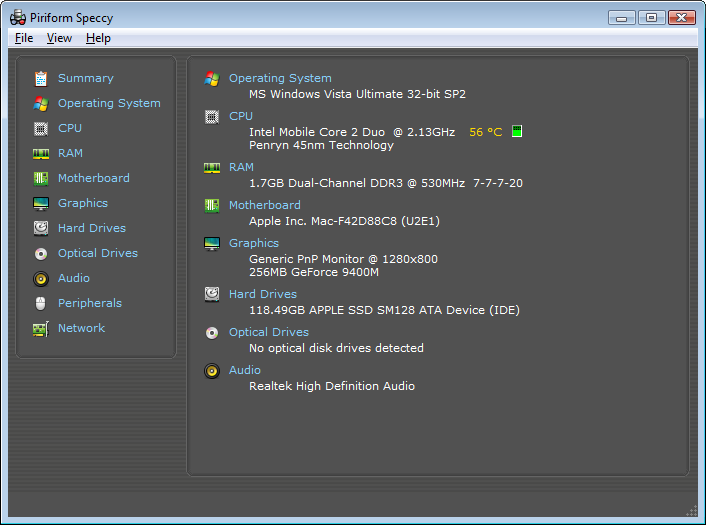 Some of the information provided by Speccy can be found in Windows Device Manager, Windows Task Manager, and Windows Resource Monitor. But, Speccy puts it all in one easily accessible place and provides the ability to print and export your system configurations and all other information it collects and monitors. Speccy supports Windows XP and later, including Windows 8. It provides fairly detailed online help that will help you navigate through the application and understand the information it provides. Successfully running a small business means knowing where to allocate your resources, and taking advantage of time-saving shortcuts when you find them. Speccy is one such shortcut—download it today.